Somebody educate me: how do people like Dianne Feinstein get elected to anything whatsoever? Feinstein shouldn't be trusted with city sanitation manager, much less United States Senator. Having failed in her bid to ban "assault weapons" (there is no such thing, incidentally) Demented Dianne has now decided that violent video games must be controlled and regulated by act of Congress. Speaking to an audience of 500 people in her hometown of San Francisco, U.S. Sen. Dianne Feinstein (D-Calif.) said that game publishers need to make voluntary actions to avoid glorifying guns and violence following the Newtown elementary school massacre in December. She noted that Congress would take action if the industry didn’t do something, according to the Associated Press. “If Sandy Hook doesn’t [make game publishers change] … then maybe we have to proceed, but that is in the future,” said Feinstein. Uhhhhh... somebody should inform Senator Feinstein that ever since the introduction of first-person shooters and other violent video games in the early Nineties, mass killings HAVE BECOME MUCH LESS COMMON! There is no correlation at all... none... between the pervasiveness of violent games and increase in crime. If there is any relation between them at all, it could in fact be argued that such games have decreased crime, not intensified it. 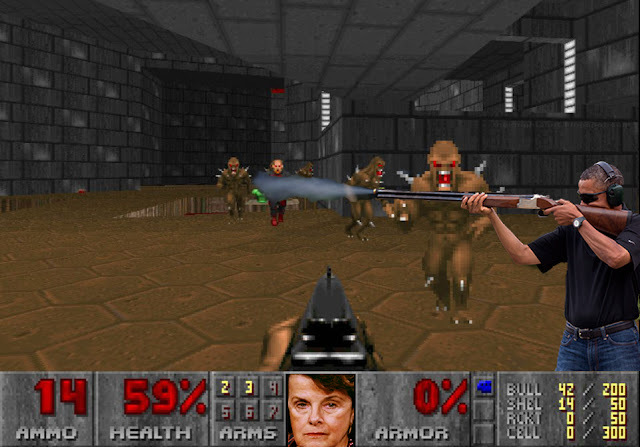 DOOM 2013: Where the insanest place is behind a Senator from California. This is the same woman who last month claimed that all veterans of the United States military are "mentally ill" and thus should not be allowed to own firearms. I would also be remiss in my duty as a blogger if it were not noted that earlier this year Feinstein expressed a desire to deprive the American citizenry of all their guns except for her own and those of other government officials (and yes, she owns a gun folks). I am going to posit something: that the Founding Fathers had exceedingly prescient foresight when they wrote the Second Amendment. If nothing else it is a last resort deterrent against the machinations of the power mad and the direly insane. The latter of which is represented by Dianne Feinstein and too many others in the halls of Congress. No, I'm not suggesting anything. Just stating that We The People are our own best scare tactic that should give pause to the truly evil. Somebody should also inform the Senator that according to the Supreme Court, video games are protected under the first amendment.